While some people care much more about the journey, others are more interested in the destination. They are focused on the direction they are going, and value being there a bit more than getting there. 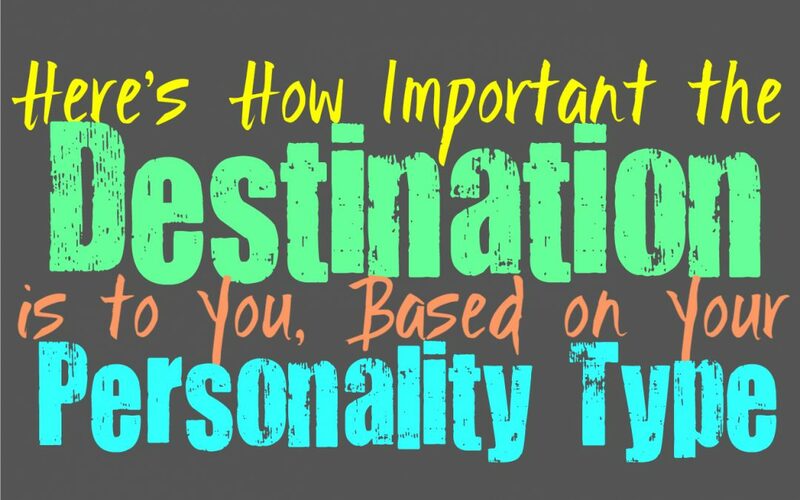 Here is how important the destination in life is to you, based on your personality type. INFJs do often value the destination quite a bit, but they also believe it is important to focus on their loved ones and enjoying their presence. They can become rather caught up on the future though, and will dream about achieving great things and making a difference. INFJs can become very caught up inside of their own minds, which makes it difficult to focus on the present all that much. They simply become distracted by their thoughts and sometimes this involves imagining the future. INFJs can become a bit disillusioned with the present, especially when their minds are caught up on brighter days. ENFJs often value the destination a lot, since they can be very future focused people. They sometimes struggle to really pay attention to the present moment. ENFJs are so drawn to building a future with their loved ones that it can be a bit challenging for them to focus as much on the journey. They want to be sure to work hard to provide a positive surrounding for the people they love most. ENFJs can enjoy the journey a bit more when they are around someone that brings this out in them. INFPs are definitely care about the destination, and believe in working towards a future they can be proud of. They often have big dreams and desires, and truly want to be able to go after them. Sometimes they can have a hard time really exploring the moment, and will become a bit too drawn towards imagining the future. INFPs definitely believe that their goals and destination is something they need to value and focus on. They simply become distracted by their own active inner minds, and sometimes even within imagining the destination. ENFPs definitely care about the destination, but at the same time they want to enjoy experiencing the journey. They don’t like becoming so hung up on the destination that they forget to actually experience things and learn from their environment. ENFPs can sometimes become caught up in their own thoughts, and this can make them feel a bit distracted from the present. Often when the ENFP is running through things inside of their mind, they can often imagine the destination and where they want to go in life. INTJs definitely value the destination and believe it is important to set meaningful goals in life. They want to work towards a better future and constantly do what they can to build something they can be proud of. INTJs believe that their actions are important, and in that way they do value the journey. They aren’t all that focused on living in the present though, and are much more interested in working towards the destination. INTJs have big goals and they believe in doing whatever they can to accomplish them. ENTJs do care about the destination quite a bit, and this is why they work so hard to make it something they can be proud of. They have big goals and want to do whatever it takes to accomplish them. ENTJs sometimes struggle to really value the journey, since they are so intently focused on where they are going. They want to make sure they forgo any momentary thrills, in order to be responsible and create a future they can be truly proud of. They do whatever it takes to accomplish a sense of greatness in their lives, and to them this is important. INTPs can definitely become a bit obsessive about the destination, and working towards a future they want. At the same time the thought of the impending future can be a bit unnerving for them. INTPs are often so caught up inside of their own thoughts that they certainly aren’t focused on the journey. The present can be neglected for their imaginations and thoughts of the future. They care about working towards something, and considering all of the different potential paths they could take. ENTPs definitely become focused on the destination, but they are capable of enjoying parts of the journey. They want to use the process as a way to learn and expand their minds and abilities. ENTPs want to be sure to pay attention to the world around them, but they can sometimes become caught up inside of their own active inner minds. They are a bit more focused on the future, but that doesn’t mean they don’t value the journey as well. For them it is about taking from what they can, and always striving to learn and grow. ISTJs definitely value the destination and work hard to make it something to be proud of. They care about their futures and want to be sure they are working towards the right goals in life. ISTJs feel the destination is truly important, and they want to make sure they do everything they can to provide for themselves and their loved ones. They can actually become a bit too focused on the destination, causing them to neglect the journey a bit. ESTJs believe that the destination is very important, and want to focus hard on making it something to be proud of. They are very focused on their futures and want to build something meaningful and worthwhile. ESTJs don’t like letting others down, and this is often why they work so hard to make their future better. They can sometimes become more focused on the destination than the journey itself, since they are very hardworking and future-oriented people. ISFJs definitely feel that the destination is important, which is why they work so hard to make it something to be proud of. They also work hard to create an environment that makes others feel happy and comfortable, and so the journey is also important to them in some ways. For ISFJs it is mostly about making a life that can provide for their loved ones and make them truly happy. They believe that creating a future and working towards a positive destination, is truly important. ESFJs do believe that the destination is extremely important, which is why they often set difficult goals for themselves. They want to achieve so much, and work towards building a future they can be proud of. They sometimes forgo momentary joys and pleasure so that they can create something meaningful in the future. ESFJs do try to enjoy the journey as well, but sometimes the thought of where they are going can become so overwhelming that they neglect living in the present. ISTPs care about the destination, but not nearly as much as they do the journey. They are more interested in enjoying the moment and soaking it all in. ISTPs don’t like becoming so hung up on the future that they miss out on what is around them. They do believe in working towards their goals, but sometimes they can become distracted. ISTPs are certainly more interested in the journey, and can sometimes neglect focusing much on the destination. ESTPs do believe the destination is important, but at the same time they want to take in the journey as well. They strive to enjoy the present moment and soak up everything around them. ESTPs do try to work towards a destination they can be proud of, but at the same time they are much more focused on the journey. They want to be able to enjoy the moment and be happy with what they have. They can sometimes struggle to focus all that much on the future, and might even neglect it at times. ISFPs often believe that the journey is far more important than the destination. They want to soak up their surroundings and enjoy living their lives in the present. For the ISFP it is important to seek out the things that bring them joy, and to actually pay attention to their surroundings. Becoming too caught up on the destination can be stifling for the ISFP, and leaves them feeling like they are missing out on what truly matters to them. ESFPs are often much more focused on the journey than the destination. While they do believe it is important to set goals, they can sometimes become distracted by their surroundings. ESFPs want to enjoy the present and soak up the happiness around them. They want to plan destinations that they can be happy working towards, but they don’t like missing out on the journey by becoming so obsessed with getting there. ESFPs become so caught up in the moment that sometimes they can forget the destination entirely.